The Champions League resumed when Bayer Leverkusen visited Ashburton Grove before we return the same favour a week later. 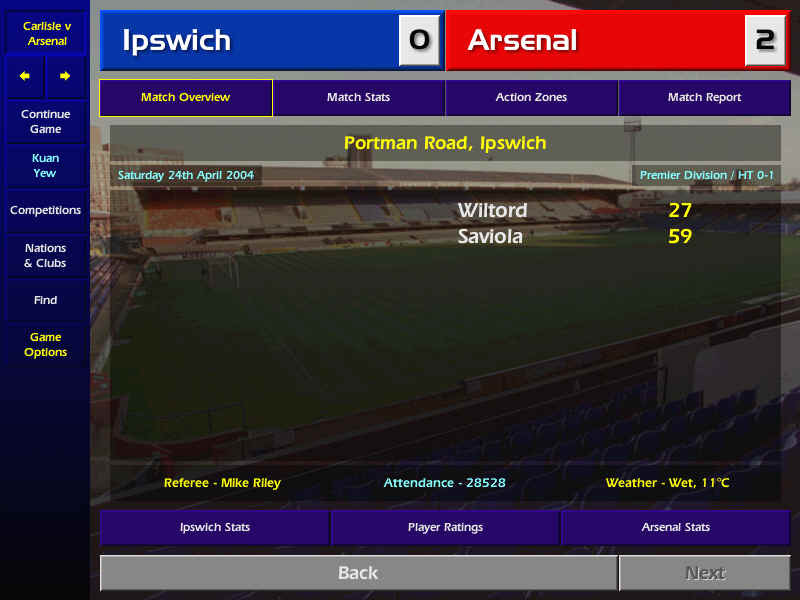 2 goals from Saviola and 1 from Vieira saw us winning 3-0 at home. 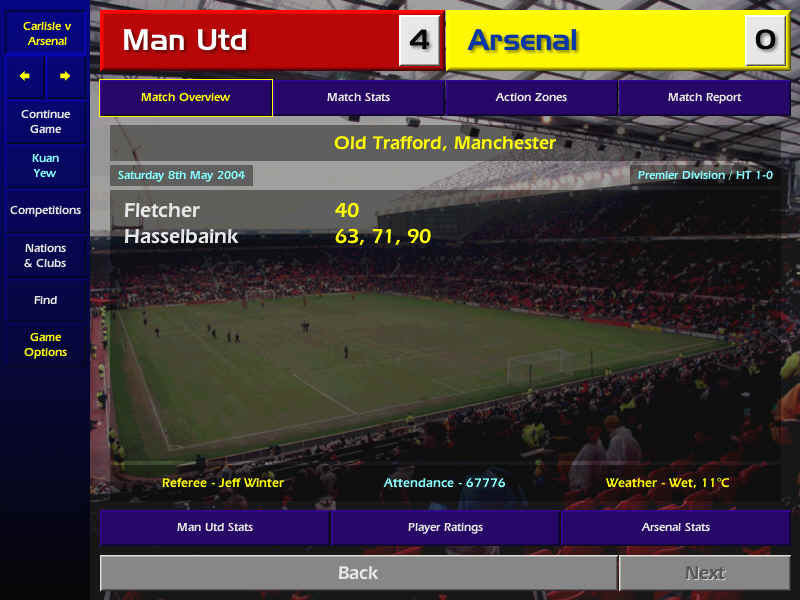 The away match was much tougher and we had to fight all the way for a 1-0 win courtesy of Bergkamp. Footballing legend Peter Shilton even took time off to criticize the way I handled the England team by writing us off from winning the European Championship. We finished off our Champions League Phase 2 Group matches by drawing with Porto 2-2 and beating Lokomotiv Moscow 2-0. The other 7 quarterfinalists are Bayern Munich, Bayer Leverkusen, Ajax Amsterdam, AC Milan, Besiktas, Barcelona and Celtic. We had a tough campaign in March where we had to take on Chelsea at home, Manchester United at home in the FA Cup Quarter Final and Bristol City in the League Cup Final. First up, Chelsea at home in the league. Ashburton Grove was packed to the roof as nearly 70,000 supporters arrived to watch the giants of English football battle it out. Chelsea had been runners up for the past few seasons and they are determined to win this season's championship, although we are still very much ahead of them. The match started well with both sides playing good football. Both goalkeepers performed well to keep both sides at bay. In the end, it was Henry's 57th minute goal that separated both teams. Manchester United on the other hand weren't so lucky. I fielded a mixed team with regulars and Reserve League players. The lads didn't disappoint me as we had a 2-0 lead in the first half from goals by Alan Quinn and Ashley Cole. A third strike by Barrett sealed the match despite Phillip Neville's consolation goal on the hour. Notman was stretched off after getting an injury to his knee. The Champions League Quarterfinals saw us taking on Celtic. We entertained them first and Henry scored his 100th Arsenal goal in the 2-0 win. 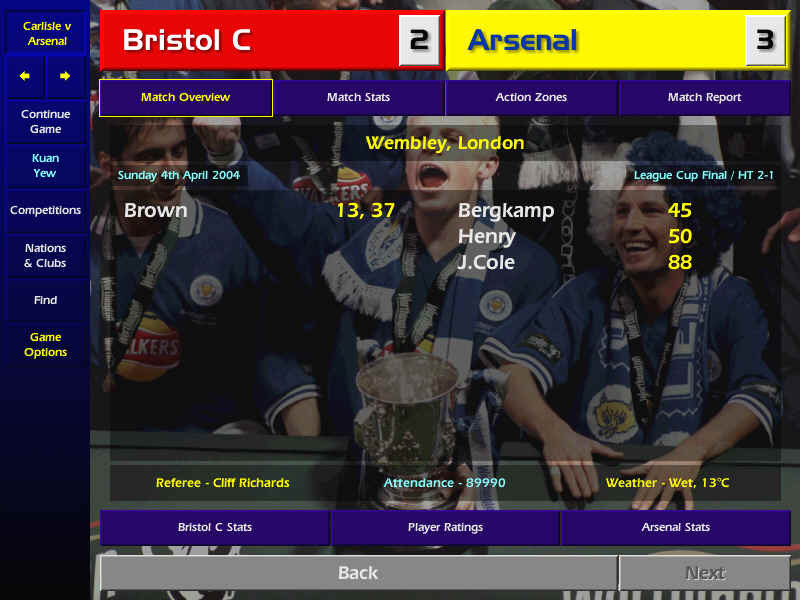 2 weeks later, Henry repeated the feat by scoring once and the other was scored by Joe Cole to give us another identical 2-0. The away match was made easier when Deschamps got himself sent off in the 68th minute.